The summer box office kicks off early with the enormously entertaining Rampage. It's a city destroying, giant monster animal beatdown, that unabashedly embraces its roots. 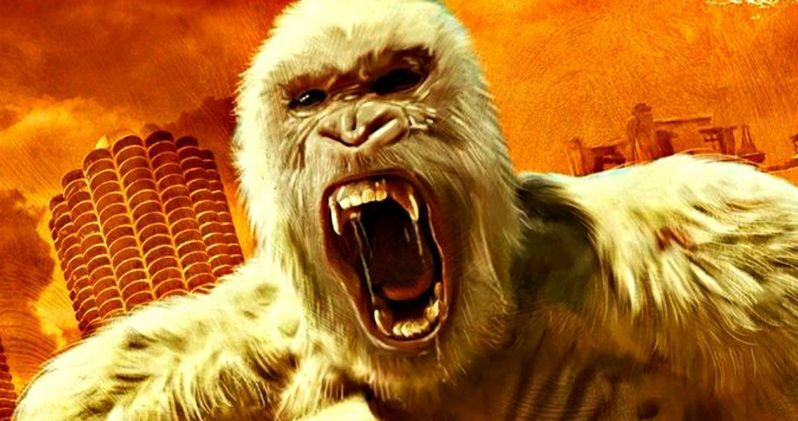 Based on Midway's classic eighties arcade game, Rampage adds heft to the origin story with archetypal characters and a better than expected plot. Director Brad Peyton (San Andreas, Journey 2: The Mysterious Island) knows how to make a film of this magnitude. His third endeavor with star Dwayne Johnson has their big-budget spectacle down pat. Dwayne Johnson stars as David Okoye, a former special forces soldier turned primatologist at the San Diego zoo. His primary ward is a mischievous, sign language communicating, albino gorilla called George. A space station run by an evil genetics corporation comes crashing down to earth in blazing pieces. Unfortunately the debris includes a top secret pathogen that hideously mutates. George, along with two animals in the wild, a crocodile and wolf, are exposed. The animals grow at an alarming rate. They become more aggressive and exhibit abilities from other species. Okaye is joined by a disgraced geneticist (Naomie Harris) and a wisecracking government agent (Jeffrey Dean Morgan). Together they try to deduce the inexplicable behavior of the monstrous animals. Unaware that the corporation's villainess CEO (Malin Ackerman) and her dimwitted brother (Jake Lacy) are pulling all of the strings. Related: Will The Rock's Rampage Ravage A Quiet Place at the Box Office? Rampage is a textbook disaster flick. You have the invincible hero, a beautiful scientist, government stooges, and a diabolical antagonist set against an apocalyptic scenario. It's a formula that works splendidly if you know how to cook. Peyton, who also co-wrote the script, is in his element as a director. He sticks to his archetypes, but with a serious approach. The result is that most of the characters aren't cartoonish. They're not overtaken by the mass destruction and violence. I was genuinely surprised by the character driven plot. Peyton even gives George the gorilla a likeable personality. The audience cares, is invested in the characters fates. The special effects are amazing. Once again, we're in Brad Peyton's wheelhouse. He knows how to deliver epic scenes. Rampage is nonstop in this regard. From the opening in space to the climax in Chicago, the film is an onslaught of action. Peyton never undercuts himself. Everything gets progressively bigger in scope. The fantastic news is that it's not all monster animals. They're the draw, but Rampage also has a plane crash that will knock your socks off. There's diversity to the carnage that builds nicely. It makes the finale thrilling, a real crowd pleaser. Rampage has a few minor issues. Jeffrey Dean Morgan costars as Agent Russell. The character is a carbon copy of his most famous role, Negan; the megalomaniacal baddie from TV's The Walking Dead. Every cocky line he spurts sounds and looks like Negan. Morgan's performance had me laughing out loud for all the wrong reasons. It's a fair criticism, but probably won't resonate if you don't watch The Walking Dead. Also, Dwayne Johnson could be Superman as David Okoye. The character is more indestructible than the mutated animals. Peyton and Dwayne Johnson have their groove going, but needed to dial some of the heroics back. One scene in particular with a helicopter looks great, but is a bridge too far; even in a monster flick based on a video game. Warner Bros. has a monster hit. The studio found the right director for the material. Brad Peyton and Dwayne Johnson are getting better with each film. I was surprised by their San Andreas and continue that feeling here. Rampage is a whole lot of popcorn guzzling, soda slurping fun. The views and opinions expressed in this article are those of the author and do not necessarily reflect the official policy or position of MovieWeb. Film critic, raconteur, praying for dolphins to grow thumbs and do better. Can Rampage Hold Back Amy Schumer at the Weekend Box Office? Just Saw Rampage and Now You Want to Play the Game for Free?